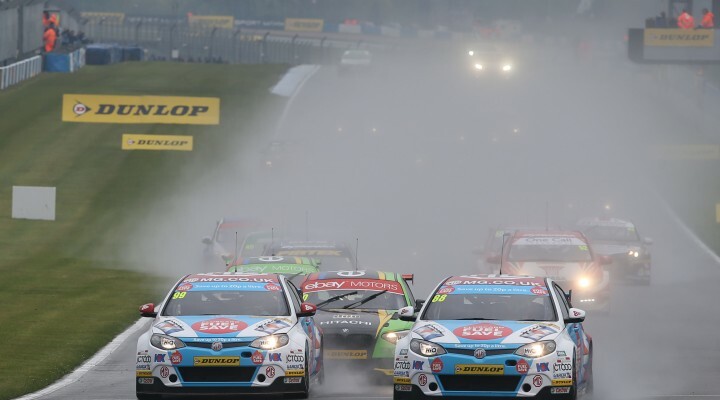 For the next #DramaInTheBTCC we move on to Donington Park, and a weekend that saw the MG KX Clubcard Fuel Save team move to the head of the field setting the outright pace in both wet and dry conditions. The first hint of the pace MG had was in Free Practice Two, where Sam Tordoff topped the session with a time underneath the previous qualifying lap record. It was to be Jason Plato, however, that stole the march in qualifying. He wasn’t quite able to match the pace of Tordoff from FP2, but still posted a new qualifying record to clinch pole on an all-MG front row. In contrast to the dry conditions on Saturday, race day began in heavy rain, but this didn’t trouble pole-sitter Plato or his team-mate Tordoff, who both drove away from the field to take a commanding 1-2 for the team. A slight mistake from Plato on the run down to turn one in the second contest gave Tordoff the opportunity to slip past the race one victor, and once again in wet conditions the brace of MGs were unmatched at the head of the field. The track dried for race three, meaning every car had to run the soft Dunlop tyre having not been able to use it in the first two contests. With the two highest levels of success ballast on board both drivers struggled to make progress, with Tordoff crossing the line 14th with Plato just holding on to a top six position.